Most of the beginners are confused about stock split vs bonus share. Whenever they hear that one of their holding stock is going to split or is giving a bonus share, they do not understand what does this mean and how this will affect their investment. As both results in an increase in the quantity of stocks and adjustment of share price, most beginners are confused whether they are same or different. Further, they do not understand why company announces stock split or bonus share. What is the basic difference between them? 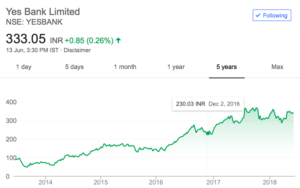 Therefore, in this post, I’m going to explain you the difference between stock split vs bonus share with the help of few past examples from Indian share market. Be with me for the next 5-6 minutes to understand this basic of the stock market. Yes bank split its share in the ratio of 1:5 on 26th July 2017. This means that every shareholder who has 1 share of Yes bank, had got 5 shares in total. 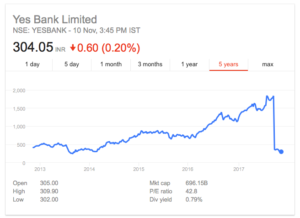 If you were holding 30 shares of yes bank, you would have got a total of 150 shares. You might be thinking- ‘Awesome, I got extra shares for free!!’. However, after the stock split, the share price of the stock also splits in the same ratio. 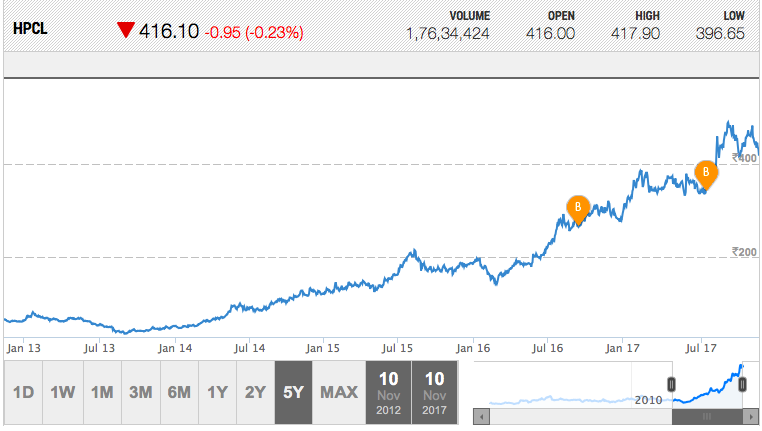 Here is the chart of yes bank after the stock split. 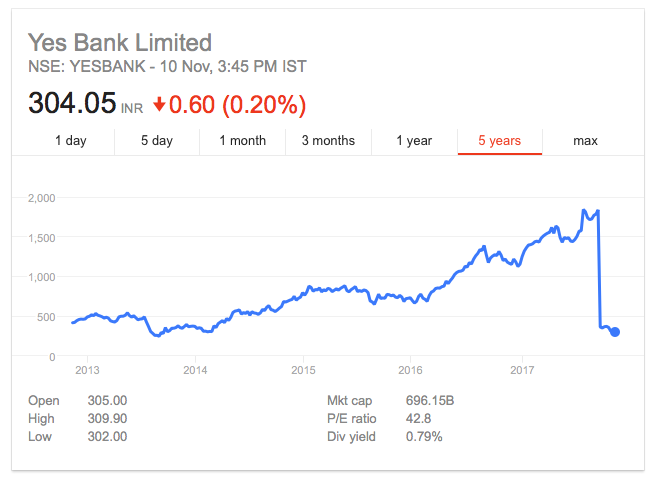 Please notice that the stock price of Yes Bank changed from Rs 1880 to Rs 376 after the split. Moreover, the price chart gets adjusted after the stock split. Therefore if you look at the same chart few months/years later than the split date, it’s impossible to estimate the date/year of the stock split. 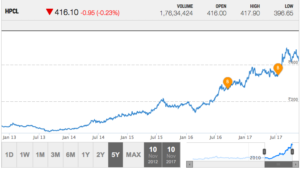 For example, here’s the price chart of Yes Bank (as of June 2018). Here, you cannot notice any spike or fall in the price of the stock split in July 2017. This is because the price history of the stock got adjusted automatically. Why does this happen and what is the impact of the stock split on its shareholders? This we will study in next section in this post. Now, let us see an example of bonus shares. Hindustan petroleum corporation limited (HPCL) announced bonus shares to its shareholders in two consecutive years. First, on 20th July 2016 in the ratio of 2:1. Second, on 26th May 2017 in the ratio of 1:2. In the first case, the shareholders got 2 shares for every 1 share in their portfolio. In the second case, the shareholders got 1 share for every 2 shares in their portfolio. 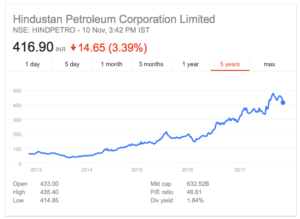 If you notice the stock chart of HPCL on google, you cannot identify the bonus stock dates. You cannot decide the bonus given by the share chart as there are no sharp spikes on the chart. In the bonus share, the stock prices are automatically adjusted. 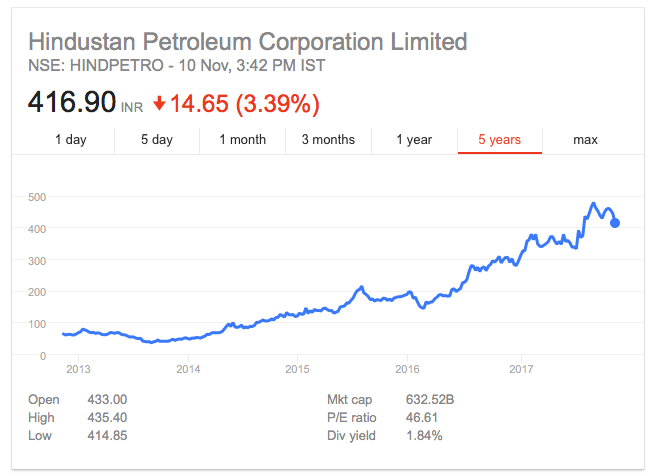 However, if you check the chart on money control, you can notice two bonuses of the share of HPCL. How does this happen? This we will study in next section. We will first understand bonus shares. We will define some financial terms here, which we are also going to use later in the post. Bonus shares are the additional shares given to the shareholders by the company. This is a method of rewarding the shareholders. How does a company give the bonus? Companies accumulate its profits in the reserve fund. During bonus share, these reserve funds are converted into share capital and distributed among its shareholders as a bonus. In short, when a company gives bonus shares, it’s share capital increases while its reserve fund decreases. Why companies give a bonus? To improve the liquidity and hence, the total trading volume of the stock. 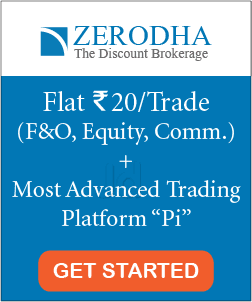 To decrease the share price and to make it more affordable for retail investors. It increases the confidence of the shareholders towards the company. Although a bonus share is a positive news for the shareholders, however, it doesn’t affect their investment amount much. After the bonus is given, the share price of the company will fall in the same proportion. Therefore, there will be no noticeable difference in the wealth of shareholder. In a stock split, the company splits the share price into different parts. For example, in a stock split of 1:1, stock price splits into two parts. In a stock split of 1:5, stock splits into 5 parts. The fundamentals of a company remain same in a stock split. There is neither increase or decrease in the share capital or reserve in a stock split. You can remember stock split as splitting the pieces of pizza. 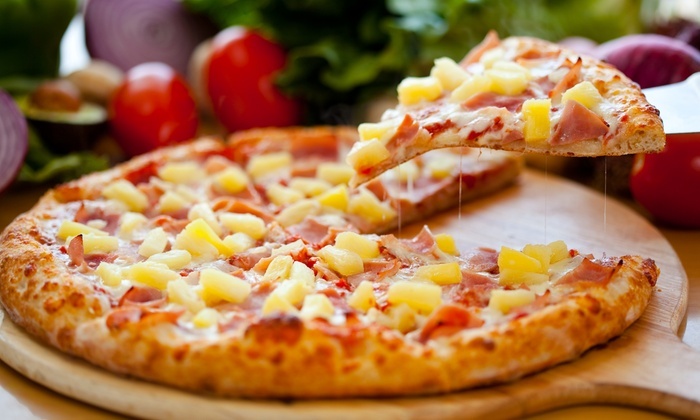 You can split the 4 pieces of pizza into 8, however, the overall pizza will be the same. To increase the liquidity of the stock and increase the trading volume. To make the stock more affordable for the retail investors. There won’t be much impact on the personal wealth of the shareholder. 1 stock of Rs 10,000 or 5 stocks of Rs 2,000; both are same for the existing shareholders. NOTE: During a stock split, EPS (Earnings per share) decreases in the same factor as stock split (because the earnings will be same, but the number of outstanding shares will increase). Hence, the price to earnings (PE) ratio will remain the same (as both Price and EPS decreases by the same factor). 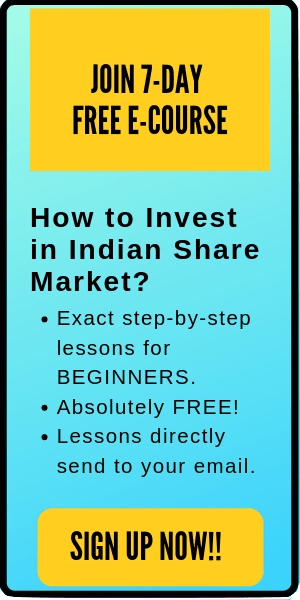 If you are new to investing and want to learn stock market basics from scratch, here is an amazing book for the beginners: How to avoid loss and earn consistently in the stock market by Prasenjit Paul. Assume there is a company, ABC. This company is currently trading in the market at a stock price of Rs 100. Face value of each share = Rs 10. Now, let us assume that the company has announced a bonus share of 1:1. The company will give an additional share of 10,000 to its existing shareholders. As the market capitalization will remain the same after the bonus share, hence the market value of the stock = 10,00,000 / 20,000 = Rs 50. Let us assume that the company makes a stock split of 1:1 (in place of the bonus share). Please note that the face value of a stock also splits during the stock split and the reserve capital decreases in bonus share. The stock price will automatically be adjusted on both stock split and bonus share on the day of implementation. In simple words, a stock split is the split of same stock into many parts while the bonus is free additional shares. Stock price and outstanding shares changes in both stock split and bonus share. While share split has no impact on the fundamentals of the company, on the other hand, reserve capital decreases in bonus share. Bonus share is taken positively by the shareholders while there is no impact of the stock split on the shareholders. That’s all for this post. 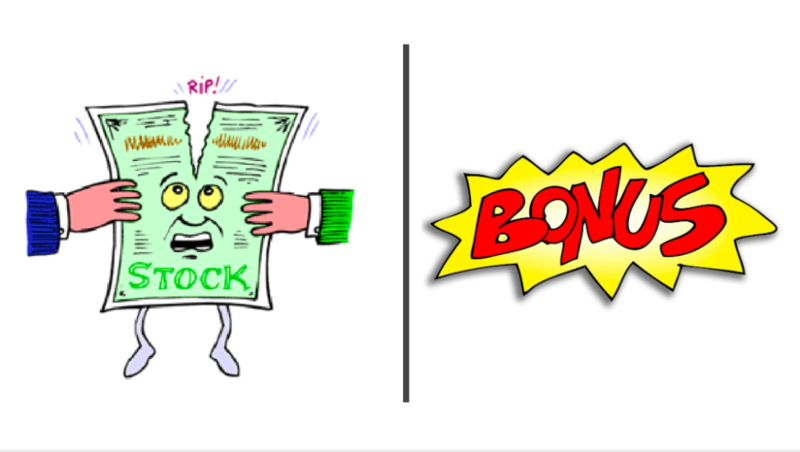 I hope you have understood the difference between stock split vs bonus share.